BATTLE CREEK, Mich., July 15, 2015 /PRNewswire/ — Amid shifting health-and-food trends, one detail remains constant – the essential role nutrients play in helping us feel our best. Although their importance is undeniable, how to get them and in what amounts often is less clear. 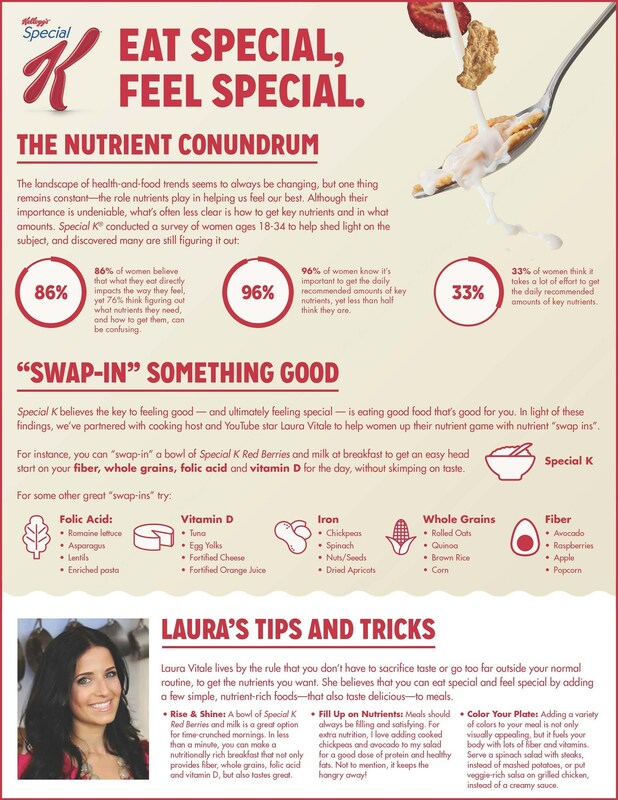 In a new survey of women ages 18-34, Special K set out to get to the bottom of this confusion, finding the majority agree that eating nutrient-rich foods makes them feel good physically (84 percent) and mentally (78 percent), yet 76 percent think it can be confusing to determine what nutrients they need, in what amounts and what foods they should eat to get them. Special K believes that the key to feeling good – and ultimately feeling special – is eating good food that is good for you. In partnership with cooking host and YouTube star Laura Vitale, they are helping women eat special to feel special, shedding light on the vital nutrients women want – fiber, whole grains, folic acid and vitamin D, among others – and showing how easy it can be to get them by adding simple food “swap-ins” throughout the day, like a bowl of Special K Red Berries and milk at breakfast. Starting the day with a bowl of Special K Red Berries and milk helps women take the guesswork out of positive nutrition, providing a convenient, nutritionally rich breakfast option that gives them the fiber, whole grains, folic acid and vitamin D they want, without skimping on taste. Rise and Shine: A bowl of Special K Red Berries and milk is a great option for time-crunched mornings. In less than a minute, you can make a nutritionally rich breakfast that not only provides fiber, whole grains, folic acid and vitamin D, but also tastes great. Fill Up on Nutrients: Meals should always be filling and satisfying. For extra nutrition, I love adding cooked chickpeas and avocado to my salad for a good dose of protein and healthy fats. Not to mention, it keeps the hangry away! Color Your Plate: Adding a variety of colors to your meal is not only visually appealing, but it fuels your body with lots of fiber and vitamins. Serve a spinach salad with steaks, instead of mashed potatoes, or put veggie-rich salsa on grilled chicken, instead of a creamy sauce. To learn more about how to eat special to feel special, and to see more results from Special K‘s survey, visitwww.specialk.com/en_us/eat-special-feel-special.html.